Are intended for carrying out various technological processes in liquid environments with dynamic viscosity no more than 1 Pa with (10pz), with a density no more than 1500 kg/m3, provide intensive hashing in all volume of the device. 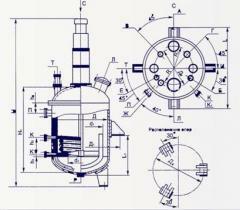 Unbelievable price on Machines for oil and gas industry in Fastov (Ukraine) company GK Evrohimmash K.O., OOO. Wide choice of quality products at affordable prices.